The coast is where the land meets the sea. Thishighly variable region begins where salt spray reaches and affects land-based plant communities and extends seaward through the surf zone as far as wave action still disturbs the sea bottom, usually to depths of about 200 ft. Indeed, the coast environment has the greatest diversity of habitats and microhabitats on Earth. Coastal life must be adapted to environmental factors that grade from one extreme to another, especially from wet to dry; wave action; and particle sizes of bottom materials. Zonation of habitats is the rule. Running parallel to the shoreline, each zone reflects conditions at specific elevations above or below sea level. Characteristic groups of organisms occupy each zone, although actual species composition varies geographically. 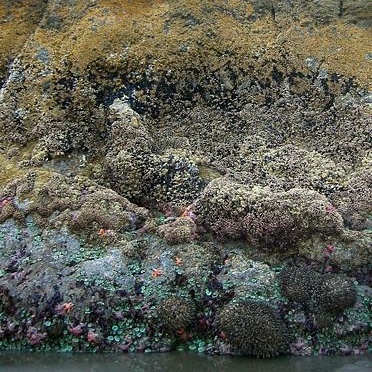 Zonation is obvious on exposed rocky shores, but much more subtle on soft-sediment coasts, where most invertebrates retreat below the surface during low tide. Sublittoral, subtidal, or nearshore zone: lower levels of coast that remain submerged at all times but are affected by wave action. Vertical zonation of seaweeds (algae) also occurs because different photosynthetic pigments absorb different wavelengths of sunlight. Green seaweeds are restricted to shallow waters in the upper eulittoral zone because the chlorophyll that gives them color only absorbs the longest, red wavelengths. In red algae chlorophyll is masked by other pigments that absorb in the orange to green parts of the spectrum. They can absorb most wavelengths and can occur at just about all depths in the coastal zone. Finally, brown algae such as kelps have both chlorophyll and fucxanthin, a pigment which absorbs short blue-green wavelengths. Brown algae are usually found in themed- to lower eulittoral zone and to depths of 30 to 50 feet in the sublittoral zone.